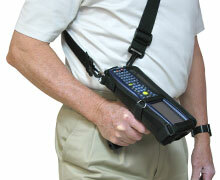 These devices are being used in warehouse situations to assist in managing inventory. Inventory is constantly being moved around on pump/ palette jacks. 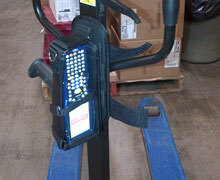 The client wanted to find a way to keep the device attached to the pump jack. Case should include additional drop protection considering the environment this device was being used in. 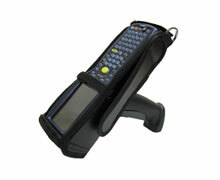 We took a pre-existing design (Scan 6) that we had done for a similar shaped device and altered it to fit the Honeywell MX7 Tecton mobile computer. By doing this we reduced the design costs and sped up production timelines for the customer. 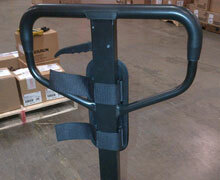 This case design has a long flexible clip that allows the case to be fastened to our Lift Truck Mounting Pad. 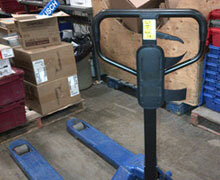 This mounting pad product was designed for forklifts but can easily be adjusted to fit a pump-jack. Combining the two products provided our client with the solution they needed. As a second carry option, the case design includes a shoulder strap so the user can wear it over the shoulder across the body. As well, the material we use (high density foam) will provide the device with added protection should it be dropped or get bumped around.